A study looking at women aged over 45 living with HIV in the UK has found that while black African and Caribbean women experience greater social isolation and subjective mental distress than white women, they are less likely ever to have been diagnosed with depression or have it treated. 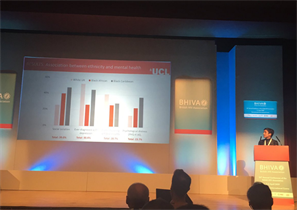 The study findings were presented at the BHIVA conference. Once-daily combination pills that can treat all genotypes of hepatitis C infection are curing almost everyone who completes a course of treatment, and drop-out rates during treatment are low, large 'real-world' cohort studies reported at The International Liver Congress in Vienna. A new edition of our Antiretroviral drug chart is now available online and in print through our patient information scheme. This one-page reference guide lists all the anti-HIV drugs licensed for use in the European Union, with information on formulation, dosing, key side-effects and food restrictions. Have you signed up to HIV update? Sent out fortnightly, it offers a round-up of the latest HIV news, for people living with HIV in the UK and beyond, giving links to more detailed articles and other sources of information. NAM has recently updated nine titles from its series of leaflets, The basics. These illustrated leaflets provide a simple and easy-to-understand introduction to key HIV issues.